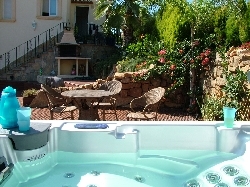 new villa set in the superb on the montgo mountain in javea AIRCON, Free WI-FI INTERNET, NEW HOT TUB ,wine rack, cots, pushchair,pool table, hocky table,and with views of the valley of javea to die for, this luxurious new villa has everthink for your idyllic holiday. 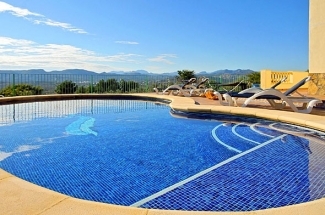 enjoy the stunning panaramic views from the� hot tub and covered terraces where you can eat outdoors and watch the glorious sunsets. 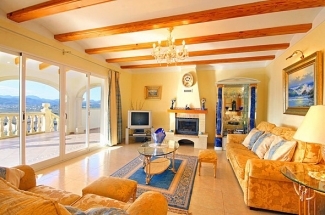 the villa offers spacious accommodation with everything you need for a relaxing holiday in the sun.casa fuchsia has a large living room with a stone fireplace, satelite tv, dvd, cd player, diningroom, both with accessto the teraces.you will enjoy the large, fully equipped kitchen with granite work tops, and all moden conveniences. master bedroom has its own en-suite bathroom, WITH DRESSING ROOM ,PLUS SAFE, the orther two bedrooms with twin beds have a shared bathroom all bedrooms have access onto the expansive terraces and are air-conditioned a beauifulI and peaceful location with its own private pool and hot tub yet only a five minute drive to the beach , golf ,shops, restauarnts of javea. property manager live by to ensure all runs smoothly. take a look at www.villafuchsia.co.uk more info on our villa. Credit Cards, Paypal.